I’m a big fan of wearing shell cordovan on rainy days. In addition to being a beautiful, lustrous leather, shell is also a dense material that’s packed with oils and waxes, making it much more water resistant than suede or calfskin. Plus, unlike your typical pair of rubber rain boots, shell cordovan boots can do double duty on both dry and wet days – pairing just as well with your fine lambskin bombers as they do with heavy raincoats and parkas. The only problem: shell can spot once it gets wet, much like you see above. If subjected to the rain long enough, those spots can turn into welts. Luckily, the damage isn’t permanent. You can get rid of those spots by letting your shoes dry naturally for a day, and then brushing them down with a soft, horsehair brush. To take care of any bumps, burnish your shoes with the backside of a metal spoon. 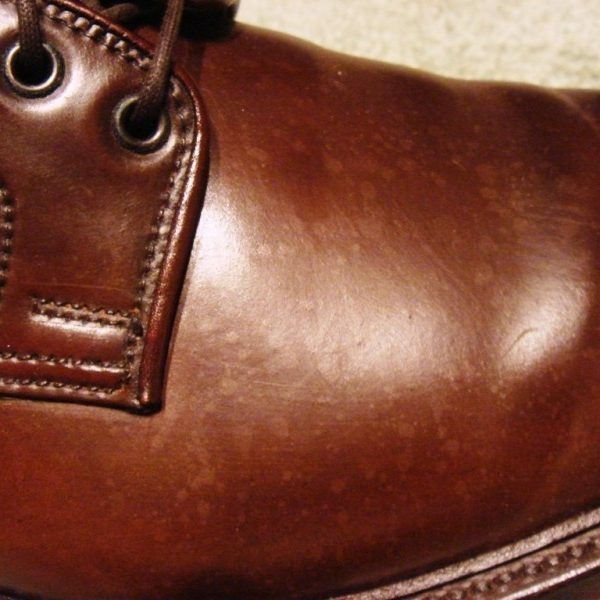 The process can take up to five minutes, but with enough effort, your shoes will restore to their original condition. Of course, needing to do that extra five minutes of work can prevent you from wearing your boots at all, so a couple of months ago, I picked up a bottle of Alden’s Leather Defender. 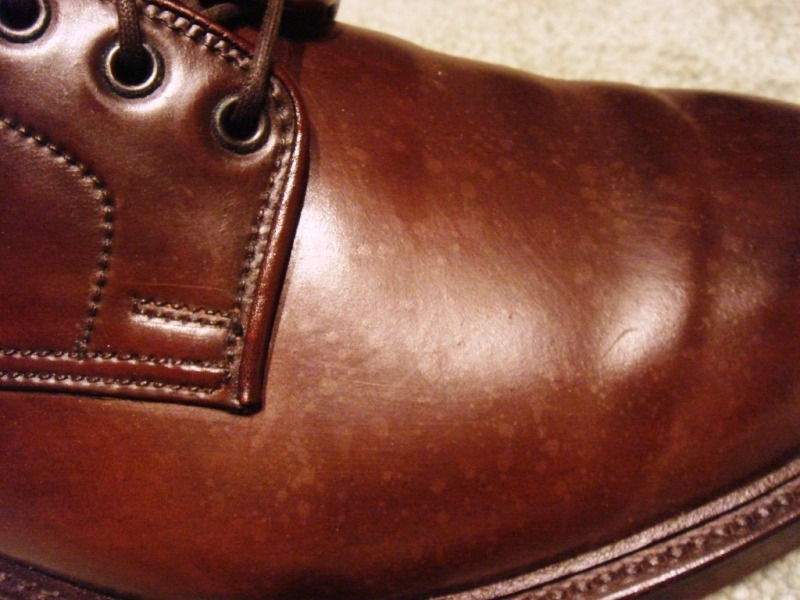 It’s essentially a water protectant for calfskins and shell cordovan. Not that shell needs it to shed water – just to prevent those spots from happening in the first place. To apply, spray the solution on a soft cloth, then gently wipe your shoes. Afterwards, buff them out to a high shine and you’ll be ready to go. I’ve been wearing my protected shell boots this past weekend. After a full day out in the rain, I was glad to see they didn’t spot one bit. My only concern: in protecting the leather from water, I wonder if it also prevents leather from soaking up conditioners. For what it’s worth, dozens of Alden fans seem to use it without any ill-effects. I don’t know if I’d use this on calfskin, but shell cordovan is already so full of oils and waxes, I’ve been happy to save myself that extra work of brushing.